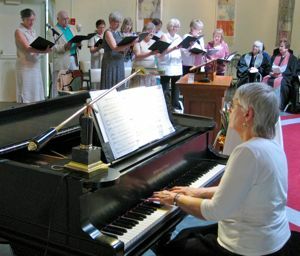 The Music Program offers many options for those in the congregation who have any interest in making music with others. It is a volunteer program and remains flexible, so people can come and go as their life situations arise. Although this presents challenges at times, it does work well and allows for individual needs and also fills the musical needs of the church. The Adult Singing Group meets most Sunday mornings before the service for rehearsals. We present an eclectic selection of pieces ranging from sacred, classical, ethnic and cultural, folk, contemporary, and chants, to name a few. Part of our mission is to create a safe and challenging place at our rehearsals and performances so that individual singers, both soloists and those in small to large groups, will be more willing to share their talents and skills. We also invite some of the youth to play instruments with the group, and this can be very affirming to our young musicians. Our Hand Bell Choir plays during the holiday season at both the all-music service and on Christmas Eve. We are very much in need of ringers, and welcome anyone who would like to learn the bells to consider it. The only qualification is some ability to read music. We look forward to have more bell-ringing this year. The NSUU Family Singers again brought many smiles during our Thanksgiving, Christmas, and Easter services. They certainly add another dimension of richness to our music when they sing. Our numbers can vary from eight to 15, but that doesn’t seem to change the joy that comes from this group. This is a fantastic musical outlet for families to sing together with many others of the larger church community. We generally rehearse the three to four weeks prior to the service at which we sing. Our goal continues to enhance the spirituality of the Sunday Service. The feedback that we often receive tells us that this is, indeed, what is happening. As always, the musicians feel grateful to reside in a church that provides so much space for their creative energy. I would be very happy to see all of our musical groups keep growing. The more the merrier! Please consider participating in one of these programs. We will welcome you with open hearts and voices. From time to time, musicians from outside our church share their talents with us. 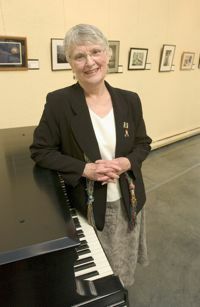 During the 2009-’10 church year, for example, our guests played two- and four-hand piano, flute, and cello, as well as voice. We also had a special service with a percussionist conducting one of the services in January and offering a drumming workshop in the afternoon that was attended by more than 30 people. This was a great success both in the morning service and the workshop in the afternoon. We hope to offer more such programs in the year to come. SoulSong is a comfort choir based at the North Shore Unitarian Universalist Church. Founded in the summer of 2014, our mission is to provide a space of peace and love at the bedside of the dying. We’ve enlarged our mission to include singing for homebound church members and individuals in long term care at the local retirement community, Brooksby Village. We rehearse every other Saturday from 9:30-11:00 at NSUU. We welcome new members who can carry a tune from both the church and the greater community. Questions? Contact Helen Brandt, director. helenbrandt17@comcast.net or (978) 729-1331.